** Having now learned how to write and identify some common kinds of organic reactions, we can turn to a discussion of reaction mechanism. 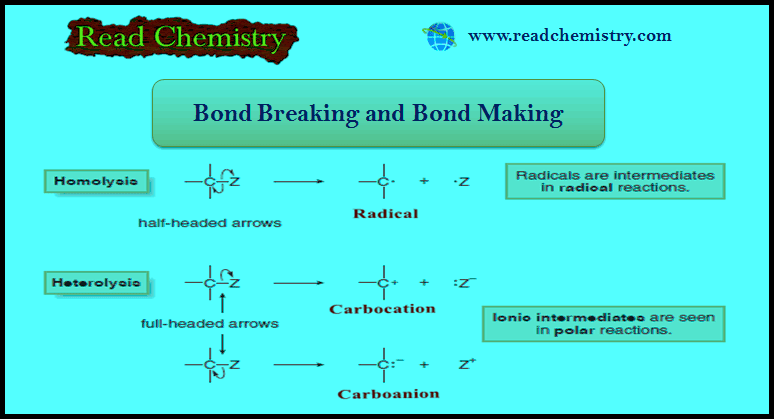 ** A reaction mechanism is a detailed description of how bonds are broken and formed as a starting material is converted to a product. ** A reaction mechanism describes the relative order and rate of bond cleavage and formation. It explains all the known facts about a reaction and accounts for all products formed, and it is subject to modification or refinement as new details are discovered. or formed, a starting material is converted directly to a product. ** Bonds are broken and formed in all chemical reactions. No matter how many steps there are in the reaction, however, there are only two ways to break (cleave) a bond: the electrons in the bond can be divided equally or unequally between the two atoms of the bond. (A) Breaking a bond by equally dividing the electrons between the two atoms in the bond is called homolysis or homolytic cleavage. (B) Breaking a bond by unequally dividing the electrons between the two atoms in the bond is called heterolysis or heterolytic cleavage. Heterolysis of a bond between A and B can give either A or B the two electrons in the bond. When A and B have different electronegativities, the electrons normally end up on the more electronegative atom. ** Homolysis and heterolysis require energy. Both processes generate reactive intermediates, but the products are different in each case. (A) Homolysis generates uncharged reactive intermediates with unpaired electrons. (B) Heterolysis generates charged intermediates. ** Each of these reactive intermediates has a very short lifetime, and each reacts quickly to form a stable organic product. ** The curved arrow notation (is a convention that shows how electron position differs between the two resonance forms) works fine for heterolytic bond cleavage because it illustrates the movement of an electron pair. For homolytic cleavage, however, one electron moves to one atom in the bond and one electron moves to the other, so a different kind of curved arrow is needed. ** The following figure illustrates homolysis and two different heterolysis reactions for a carbon compound using curved arrows. Three different reactive intermediates are formed. Homolysis of the C – Z bond generates two uncharged products with unpaired electrons. ** A reactive intermediate with a single unpaired electron is called a Radical. ** Most radicals are highly unstable because they contain an atom that does not have an octet of electrons. Radicals typically have no charge. They are intermediates in a group of reactions called radical reactions, which are discussed in detail in Chapter 15. Heterolysis of the C – Z bond can generate a carbocation or a carbanion. ** Giving two electrons to Z and none to carbon generates a positively charged carbon intermediate called a carbocation. ** Giving two electrons to C and none to Z generates a negatively charged carbon species called a carbanion. (1) A carbocation contains a carbon atom surrounded by only six electrons. (2) A carbanion has a negative charge on carbon, which is not a very electronegative atom. (3) Carbocations (electrophiles) and carbanions (nucleophiles) can be intermediates in polar reactions—reactions in which a nucleophile reacts with an electrophile. ** Thus, homolysis and heterolysis generate radicals, carbocations, and carbanions, the three most common reactive intermediates in organic chemistry. 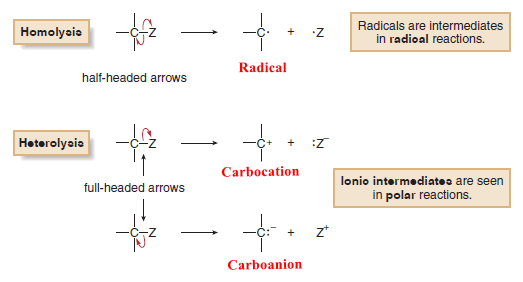 ** Radicals and carbocations are electrophiles because they contain an electron-deficient carbon. ** Carbanions are nucleophiles because they contain a carbon with a lone pair. ** Like bond cleavage, bond formation occurs in two different ways. (a) Two radicals can each donate one electron to form a two-electron bond. (b) Alternatively, two ions with unlike charges can come together, with the negatively charged ion donating both electrons to form the resulting two electron bond. ** Bond formation always releases energy. ** The following Table summarizes the many kinds of arrows used in describing organic reactions. (a) In this reaction, the C – O bond is broken heterolytically. Because only one electron pair is involved, one full-headed curved arrow is needed. (b) This reaction involves radicals, so half-headed curved arrows are needed to show the movement of single electrons. One new two-electron bond is formed between H and Cl, and an unpaired electron is left on C. Because a total of three electrons are involved, three halfheaded curved arrows are needed.